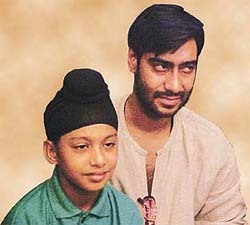 Nakshdeep did not undergo any formal training in acting and neither did he audition for the role of young Bhagat Singh. Gurcharan Singh Channi, a friend of his father, who was well aware of Naksh’s talent for acting, recommended his name to Santoshi, says Manjula Wadhwa. ELEVEN-YEAR-OLD Nakshdeep who played the role of chhota Bhagat Singh in The Legend Of Bhagat Singh is the only child of Komal Singh and Amarjeet Kaur, residents of SAS Nagar. Naksh, a student of Class VI of Tender Heart School, Sector 33, Chandigarh, is an extremely confident, brilliant and cheerful child. No doubt, stepping into Bollywood and featuring in Raj Kumar Santoshi’s big-budget film is a thrilling experience for him but this is not his debut in the film world. He has already played a major role in a Punjabi Telefilm Tilkan, produced by B.N. Sharma and directed by Gurdeep Bhullar. This movie, based on the theme of AIDS has already been released in Canada. His talent started coming to the fore at a tender age of two years when he participated in Baal Preet Milni Kafla — a children movement for human solidarity through informal education. In addition, he is also acting in Panag Films’ production Dhiyan. He has also been assigned the role of Puran in Puran Bhagat produced by Ram Ratna. Naksh did not undergo any formal training in acting and neither did he audition for the role of young Bhagat Singh. Gurcharan Singh Channi, a friend of his father, who was well aware of Naksh’s talent for acting recommended his name to Santoshi. Santoshi was looking for a smart boy from a Sikh family who could play the role of young Bhagat Singh in the film. On the basis of photographs and bio-data, Naksh was selected to play the role. "Raj ji, maybe the shot would look better like this" — a usual suggestion from an actor to a director, you might think, except in this case the director was Raj Kumar Santoshi and the actor 11-year-old Nakshdeep Singh. The boy took no time in winning the heart of Santoshi because of his confidence. Naksh’s father Komal Singh who has acted as Bhagat Singh’s father-in-law in the film, is working as an assistant editor of a children magazine, Pankaharia, published by the Punjab Government under the aegis of Punjab School Education Board. His mother, Amarjeet Kaur, apart from working as senior assistant in PSEB, has been actively associated with different organisations working for the rights of women. She is, at present, joint secretary of employees’ union of non-teaching staff in her office as well as general secretary of social organisations Shamsheer and Stree Talmel Committee. No wonder, Naksh has inherited literary traits from his father and confidence from his mother. Asked how he felt when the first shot was taken, Naksh beamed, "Mazza aa gaya". At times the shooting for the film would start at 9 p.m. and go on till 6 in the morning. He features in the scenes focussing on the Jallianwala Bagh massacre and Non-Cooperation Movement. He has a 25-minute role in the film. Naksh is also good at drawing and painting. He is good with computers also. Apart from basic knowledge about computers, he knows C and C++. The most interesting fact is that he has neither joined any computer coaching institute nor there is anybody at home to guide him. Asked about the reaction of his school teachers and classmates, Naksh happily says that now he finds a change in the attitude of his teachers and the principal. The teachers feel proud of his achievements. As far as studies are concerned, his mother said he still gets 95 per cent marks, as before.